ONEIDA, Wis. (AP) Katherine Kirk hadn’t won a tournament in seven years until capturing last year’s inaugural Thornberry Creek LPGA Classic. Now, she’s back to defend her title and end another slump. In her last six tournaments, she missed the cut five times and tied for 61st in the other. 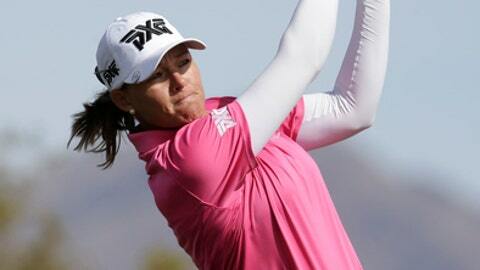 At last week’s KPMG Women’s PGA Championship, she shot a second-round score of 11-over 83 to miss the cut. It was the worst round of her professional career. On Thursday, she shot the best round of her career, a 10-under-par 62 to take the first-round lead. What is it about Thornberry Creek that brings out the best in Kirk? Kirk wasted no time in picking up from where she left off last year. Starting on the back nine, Kirk opened with three consecutive birdies and ended her day with a perfect wedge into the par-5 ninth for a tap-in birdie. Kirk needed to keep her foot on the gas because 21 players shot 6-under or better. Sei Young Kim was a stroke behind at 63, and Brittany Marchand and Megan Khang were tied at 64. ”This is a course you can be aggressive with, and I personally like to play aggressive,” Khang said. Emma Talley made a run at Kirk late in the afternoon. After an opening bogey, she made nine birdies in a stretch of 10 holes to get to 8 under through 11 before cooling off. She finished with a bogey and was one of seven players at 7 under. ”I was already counting in my head at one point, `What do I have to do to shoot 59?’ But it kind of went downhill from there,” Talley said. Sung Hyun Park, who won her second career major in a three-person playoff at last week’s KPMG Women’s PGA Championship, started with a bogey and never got rolling with a 2-over 74. Nasa Hataoka, who lost to Park in the playoff after winning in Arkansas the week before, shot 3-under 69. Kirk’s round put her in contention for her first top-10 finish since February. It won’t be easy as 33 players shot at least 5-under. That list includes Ariya Jutanugarn, who shot 6-under. The scoring average was 69.58.